The approximately 2,300-deeded acres of Jane Fonda's Forked Lightning Ranch provide a diverse ecosystem of placid beauty. 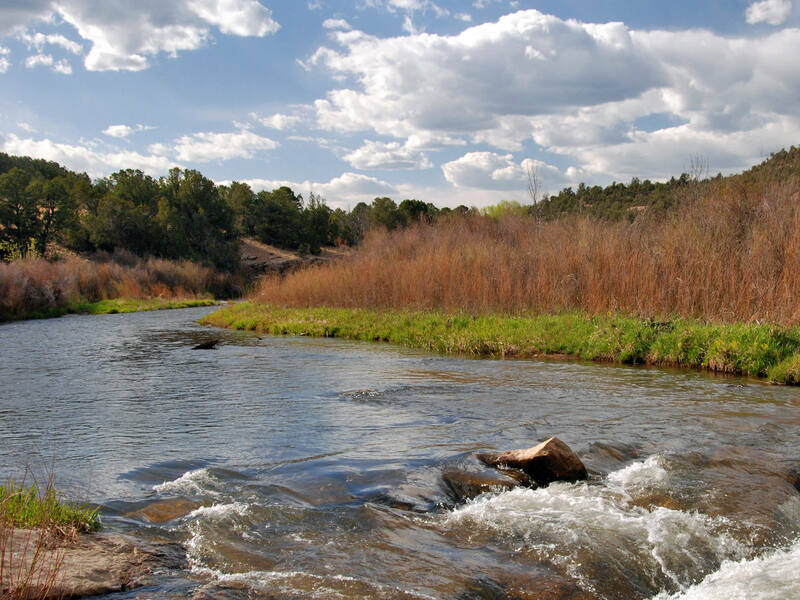 The Pecos River, one of the finest trout fisheries in the state, circuitously flows for about three and a half miles through the luxury Ranch creating an oasis for a variety of Rocky Mountain wildlife and a haven for anglers seeking healthy rainbow and brown trout. To float or wade its classic riffle run and pool water during June’s higher flows when the remarkable salmon-fly hatch explodes, provides one of fly fishing’s most rewarding experiences. The meaty adult salmon fly causes even the wiliest trout to throw caution to the wind and feed voraciously. Consisting of healthy willows and cottonwoods along the riparian corridor, craggy outcroppings of sedimentary-rock formations molded from thousands of years of being washed by the undulating waters of the Pecos, to the rolling foothills with lush stands of native grasses and pinon and ponderosa pines, the Ranch encompasses all of the extraordinary and distinctive elements of the American Southwest. The enchantment of Forked Lightning led Fonda to spend two years hiking, camping and horseback riding, meticulously analyzing every nuance of the river and the Ranch in order to find the ideal site for her personal dwelling. From examining the seasonal sunsets and sunrises, how the spring-rain showers sweep across the high-desert landscape and assimilating the features of the Southwest-style architecture, Fonda’s River House was sited and created providing an elegant refuge with state-of-the-art technologies. 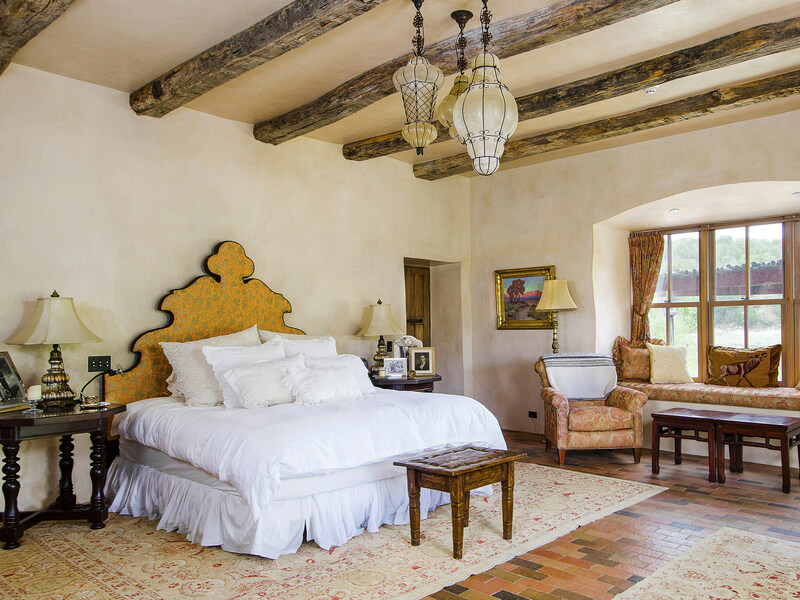 The approximately 9,585 square-foot Spanish colonial style River House, recently featured in the March 2014 issue of Architectural Digest, brought to reality Fonda’s vision as she directed the design of every passage, bedroom, living space and roof line. Fonda has incorporated energy-efficient, sustainable resources, methods and materials into the restoration, building, and landscaping throughout the Ranch. In the early 1960s under the ownership of Texas oil tycoon Buddy Fogelson and his wife, film actress Greer Garson, the Hacienda and barn were designed by renowned New Mexico architect John Gaw Meem on his signature Pueblo Revival design. Fonda maintained this distinctive style in the reconstruction of the Hacienda and the renovation of the barn as a twelve-stall equestrian stable. The equestrian facilities are functional and well maintained, and together with the adjoining paddocks and healthy native pastures could comfortably handle a sizable remuda or a few personal saddle horses. Adjacent to the expansive Santa Fe National Forest to the east and the Pecos National Historical Park to the north, the idyllic setting provides numerous opportunities for horseback riding and hiking on the vast trail network. 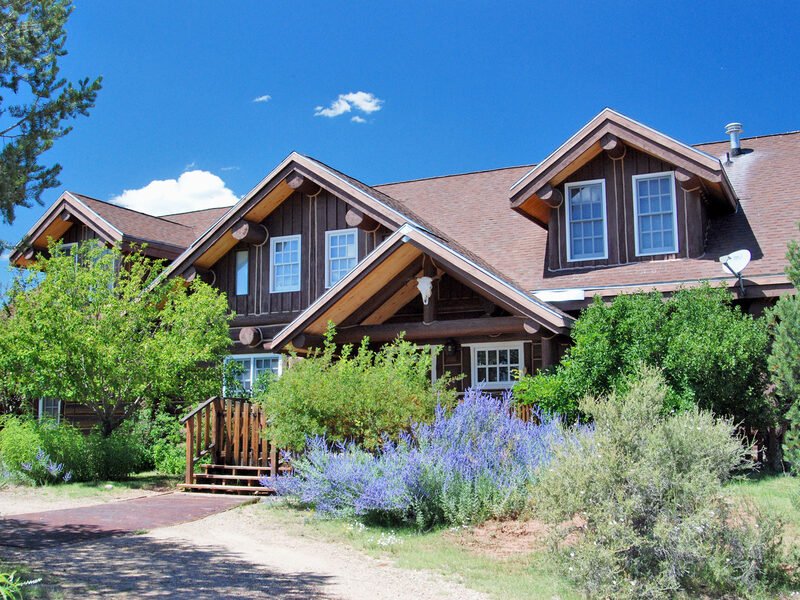 The Ranch is utilized as Fonda’s personal sanctuary where she enjoys fly fishing and horseback riding on the miles of trails within the Ranch. 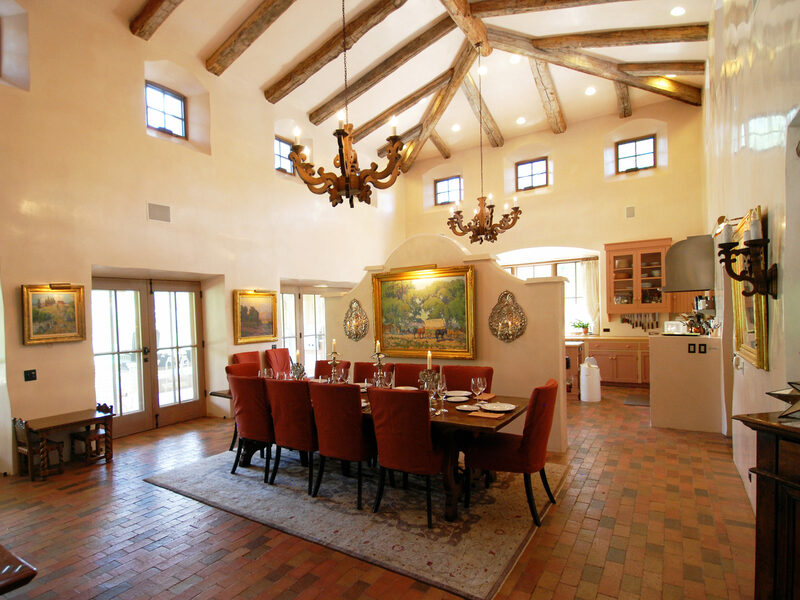 Forked Lightning Ranch, conveniently located within 25 minutes of the historically significant city of Santa Fe, offers the opportunity to own an exquisite equestrian property to relish as your own private sanctuary or family retreat. Forked Lightning Ranch may be purchased inclusive of the Personal Property. Prospective Buyers must be aware that any Personal Property purchased will be outside of the real estate transaction and negotiated independently. Conveniently located off of Interstate 25, Forked Lightning Ranch, situated on the outskirts of the unincorporated community of Rowe in San Miguel County, is southeast of the historic town square in Santa Fe, New Mexico. Rowe is home to both the Pecos National Historical Park and the Tarnoff Art Center. A portion of the Pecos National Historical Park was once part of Forked Lightning Ranch. In 1991, Greer Garson Fogelson sold the Ranch to The Conservation Fund which donated it to the National Park Service to become part of Pecos National Historical Park. Tarnoff Art Center (TAC) is a non-profit arts organization dedicated to education in the visual arts through classes, outreach programs, gallery exhibitions and events. The village of Pecos,New Mexico, about 6 miles from the Ranch, has a small convenient store/gas station, several casual dining establishments, and a small medical clinic. The Pecos Independent School District offers children of the surrounding area a quality education. The District includes three schools that serve just over 700 students from pre-kindergarten through grade twelve with a student teacher ratio of 13:1. In 2013 the US News and World Report ranked the Pecos High School in the top 11% of public high schools in the United States. It also ranked 13th out of over 200 high schools in the state of New Mexico. Located about 30 miles from the Ranch, Santa Fe, New Mexico – the oldest capital city in North America, is a premier destination for art, architecture, history, culinary experiences, as well as the world-class Santa Fe Opera. Santa Fe is the site of both the oldest public building in America – the Palace of the Governors and the nation’s oldest community celebration, the Santa Fe Fiesta which began in 1712. Convenient air service is available at the Santa Fe Municipal Airport (SFA), a small airport offering commercial flights through United Airlines with non-stop jet service from Denver, CO and American Airlines providing direct flights from Dallas/Fort Worth, TX and Los Angeles, CA. Santa Fe Air Center is a full-service Fixed Based Operator (FBO) providing fuel, maintenance, transient parking and hangaring. For additional information, the FBO can be contacted at 505-471-2525. The largest airport in New Mexico, Albuquerque’s International Sunport (ABQ) is an hour and twenty minute drive from the Ranch. ABQ offers service by eight airlines with over twenty non-stop destinations around the nation. The commercial airlines servicing ABQ include Alaska Airlines, American Airlines, Delta Air Lines, New Mexico Airlines, JetBlue Airways, Southwest Airlines, United Airlines and US Airways. Within the Property boundaries of Forked Lightning Ranch an extensive and well-maintained internal road system has been developed utilizing gravel from the Ranch to create year-round access to most areas. The altitude on this New Mexico Ranch ranges from about 6,600 feet along the banks of the Pecos River to approximately 7,158 feet at the highest peak. River House, the main residence, sits at about 6,635 feet overlooking the Pecos River. Historically, summer temperatures range from 53° to 86° Fahrenheit with winter temperatures ranging from 17° to 49° with the last freeze of the spring around May 1st. Annual rainfall is about 14 inches with August bringing the most moisture, and the area typically receives about 28 inches of snow a year. This arid climate offers about 320 days of sunshine with humidity levels around 40 percent. The southern region of the United States has been experiencing drought-like conditions for the past several years, lowering the average annual precipitation. Typically, the “wet-season” in this region of New Mexico is April with spring rain showers bringing the high-desert vegetation to life for the summer months. Normal years bring additional summer rains again during the months of July and August giving the countryside another healthy drink before going into fall and winter. When Forked Lightning Ranch was acquired by Ms. Fonda, she spent the following two years completely refurbishing the Hacienda, Equestrian Facilities and the Log House, while maintaining the original historic southwest design. Sustainable, energy-efficient methods and materials have been incorporated into the building and restoration of the Ranch improvements including the extensive use of solar, the recycling of gray water and incorporating native materials. Underground sprinkler-irrigation systems which utilize gray water collected in cisterns, water the grass and immediate surroundings of the improvements. Drip-line irrigation keeps the scrubs and trees well watered and healthy. Overall, the improvements appear to be in excellent repair with virtually no deferred maintenance for a new owner. The Ranch Staff has done a magnificent job with facility maintenance, weed control, pasture management and road maintenance. 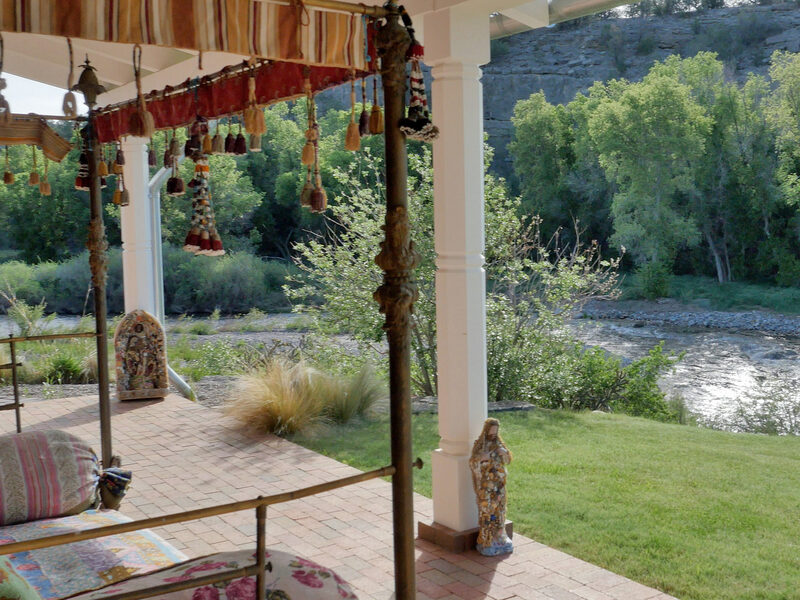 Before siting River House, Fonda spent months camping along the banks of the Pecos River seeking a location where she could view the River both coming and going through the cottonwood trees with the rocky cliffs as a backdrop without risk of being isolated by possible flood waters. River House was built according to the architectural vernacular of New Mexico, with a tin roof, a bell tower, and deep-set windows; the brick used throughout is in four shades inspired by the sunset. Architectural Digest, March 2014, Page 146. The architecturally-correct 9,585± square foot River House is a perfect complement to the site along the banks of the Pecos River. With an additional 1,200 feet of portal space, River House exudes the feel of Old Mexico. Fonda was interested in re-creating the look of traditional northern New Mexico dwellings – typically rambling ranch homes that have been added on to over the years. River House was given many of the region’s classic architectural features, among them double adobe walls, a pitched tin roof, and a hand-troweled plaster exterior in a sunbaked terra-cotta color. Reclaimed-wood beams were painstakingly collected for the ceilings, while antique doors were procured from dealers in and around Santa Fe. Fireplaces were built from designs found in a seminal book on New Mexican hearths, and bricks in a range of sunset hues were laid down as flooring, another local hallmark. Architectural Digest, March 2014, Pages 146-148. Upon entering River House, the expansive foyer, with bedrooms positioned on either side, opens up to the second floor exhibiting Fonda’s personal library. Inspired by Santa Fe’s Public Library, Fonda’s galleria on the second floor contains thousands of books acquired over decades of gifts and collecting inspirational readings. The house has a rustic, handcrafted look that belies its newness, with elements such as carved-wood chandeliers and oxidized-tin sconces bolstering the impression of age. Architectural Digest, March 2014, Pages 148. The kitchen is adorned with stainless-steel appliances including a Sub Zero refrigerator, a LaCornue custom-designed convection oven and range and an Asko dishwasher. The expansive pantry with a second Sub Zero refrigerator located just off the kitchen provides ample room for supplies and food to support numerous guests for an extended time. Often, local chefs are engaged to cook for private groups visiting the Ranch. With six bedrooms and five full bathrooms, the home affords ample space for family and guests while providing privacy and comfort. The master suite was carefully designed with a personal study to provide a quiet room to write, work or reflect. The patio off the master opens to the river corridor leading to the ambling waters of the Pecos. There is a second master bedroom designed as a junior suite. It shares a spacious and well-adorned bathroom and a second bedroom containing two twin beds, ideally setup to accommodate a family with children. There is also a third roomy bedroom with an accompanying office space, and a dormitory in the second level of the home. The approximately 590 square-foot basement houses the mechanical features of River House including the utilities for the radiant-floor heat, solar-electric power system, electrical systems and boilers. The mechanical room is efficiently engineered and maintained. The entire compound is tied into a substantial back-up generator system which is located in a separate building to ensure the peace and tranquility if back-up power is required. A large cistern is located beneath the driveway area for rain- and gray-water storage. Irrigation water is pumped from the cistern to water the surrounding landscape. Stepping stones lead from River House to the 20¢ x 60¢ swimming pool located in a secluded oasis surrounded by ornamental gardens and trees. The non-chorine pool has a natural-filtration system and is beautifully designed with native-stone pavers surrounding the perimeter of the pool. The organic garden, which cultivates a sense of place, utilizes cloth hoops to cover the raised beds providing a variety of fresh vegetables and herbs year round. Constructed in a Pueblo Revival style, the oversized double car garage with a third bay for ATVs and mountain bikes is separate from River House. With an adobe-brick interior accented with exposed timbers, the Garage contains a half bath and is heated with propane-gas forced air. The Log House is located about two miles from the Ranch Headquarters on the Upper Road overlooking the Pecos River Valley and the adjoining Santa Fe National Forest and Pecos National Historical Park. The approximately 3,409 square feet of living space is open and welcoming consisting of two bedrooms and two and a half baths. A spacious loft is currently utilized as an exercise room and office area, or it could provide for additional bedroom space. The bathrooms have tile floors and linoleum countertops. A functional kitchen offers a spacious pantry, double ovens and GE appliances throughout. The Log House was the first structure refurbished in the 2000-renovation plan and utilized by Fonda as her main residence while River House was being constructed. Propane-radiant floor heat runs through the native brick floor on the main level of the house with a wood-burning fireplace for ambiance and to take the chill off on cool winter evenings. The Log House is served by an individual well that supplies water to two twenty-thousand gallon storage tanks which then gravity flows water to the House. It is also served by an individual septic system. Located near the Ranch entrance, the entire Headquarters is served by an individual well that feeds two twenty-thousand gallon storage tanks. The water is gravity fed to each of the individual structures. A common septic system serves this entire complex. The Hacienda, ideal living quarters for a ranch manager or guests, is approximately 2,125 square feet of living space and comprised of two wings with a courtyard in the center. The west wing consists of two bedrooms that share a ¾ bathroom and an additional bedroom with a ¾ bathroom. The east wing is comprised of a master bedroom with a ¾ bathroom and a guest room. A functional and well-designed kitchen contains modern GE appliances, ample counter space with a center island for additional storage and food preparation. The kitchen area flows into a traditional Spanish-style living space accented with a wood-burning kiva fireplace utilized for both heating and ambiance. A spacious 250± square-foot patio to the southwest opens up off of the kitchen facing Rowe Mesa providing a welcoming space. The Hacienda is heated with propane-radiant floor heat and the kiva fireplace. Solar panels augment the power supply. Consisting of twelve 12´ x 12´ horse stalls, each stall is served by Ritchie automatic horse waterers. Two individual storage areas are utilized for various ranch supplies. The birthing stall and wash stall each contain hot and cold water spigots. Originally designed by Meem, the horse stable is well planned and functional. Approximately 3,235 square feet of covered loafing-shed space provides an expansive area for horses or livestock to find reprieve from a hot summer day or blustery winter evening. Two 29´ x 30´ storage areas are also contained within the horse facility allowing for various ranch supplies to be stored out of the weather. Approximately 900 square feet of dedicated space is provided for tack storage as well. The tack room is heated with solar radiant-floor heat. The covered hitching post off of the tack room is easily accessed allowing riders to saddle up in the shade before heading out on a trail ride. There is a solar hot-water system for the radiant-floor heat in the tack room and certain areas of the Equestrian Facilities. The Garage is located adjacent to the horse facilities on the north side and can be accessed through the horse barn. This approximately 1,806 square foot facility is comprised of four individual bays with 14´ electric roll-up doors. It also contains a half bathroom and wash basin. The Garage is heated with solar radiant-floor heat and supplemented by propane gas forced-air heat. An approximately 18´ x 20´ solar-heated greenhouse is situated on the east side of the Garage and position to maximize the morning sunshine. The Ranch Office is the hub of activity and information on Forked Lightning Ranch. Located immediately upon entering the main Ranch compound, the Office is where Ranch Staff meet daily to organize their work day. Ranch maps, files and overall Ranch operations are run out of the Ranch Office. Attached to the main Equestrian Facility, the Ranch Office also houses a half bath and washroom area and is heated by solar radiant-floor heat. The Ranch would not be complete without a signature Jane Fonda workout facility! The 30¢ x 20¢ Gym contains all of the latest fitness equipment, free weights, and Pilates’ accessories. Fonda’s entire library of workout and exercise videos including many other acclaimed trainers is at your disposal. The entire east wall is mirrored and rubber-mat flooring is installed throughout. While this New Mexico Ranch is connected to the grid, solar panels throughout the Ranch supplement the existing power supply. The stand-alone solar-generator hybrid residential power system was designed and is maintained by Positive Energy Inc. based out of Santa Fe. All power line and utility lines serving the improvements throughout the Ranch are underground with electricity provided by Mora-San Miguel Electric Co-Op. Propane gas is provided by AmeriGas, and delivered on an as needed basis by a local provider. Wireless internet service is provided throughout the homes and Ranch Office by Sentiva. Reliable cell service is available on the Ranch through Verizon. The private tower, located on the 7,158´ high point within the Ranch, provides Wi-Fi Internet and extended cell service throughout the Ranch. A computerized Gemini security system safeguards all of the Improvements. The taxes on the real estate and improvements for 2013 were $33,932.24. River House – A domestic well near the River House location feeds four ten-thousand gallon storage tanks which in turn gravity feed the House and garden area. River House – An artesian well permitted to divert up to 1.0 acre feet per annum for domestic purposes is utilized primarily for irrigation and backup water for the River House if needed. Hacienda – The well near the Headquarters of the Ranch also feeds two twenty-thousand gallon storage tanks which gravity flow to the Hacienda and the Equestrian Facility. Log House – A domestic well near the Log House feeds five ten-thousand gallon storage tanks which in turn gravity feed the Log House and garden area. Fire hydrants are located near the Garage, River House and Log Cabin for fire suppression. The fire hydrants are supplied by the storage tanks located in their respective locations. This water permit provides for approximately 12.13 acre of land to be irrigated from the Pecos River under an 1870 priority date. For additional information and maps designating the place of use, please contact our Bozeman Office or the New Mexico State Engineer’s office in Santa Fe, New Mexico. The Seller will convey with the Ranch 100% of whatever mineral, oil, gas, geo-thermal, hydro-carbon and gravel rights it actually owns, subject to reservations by previous owners. The Seller makes no representation as to the quantity or quality of any mineral or other subsurface rights appurtenant to the Ranch. 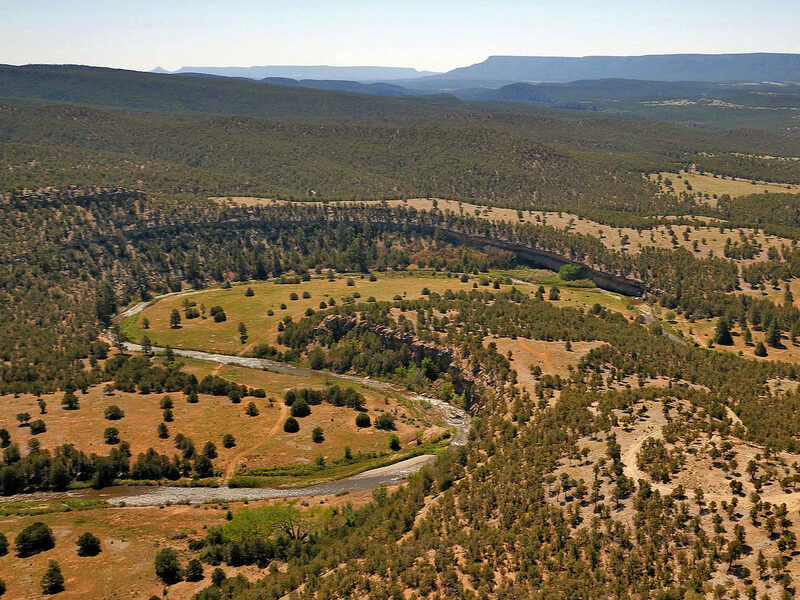 The New Mexico Land Conservancy holds two conservation easements on Forked Lightning Ranch. Executed in December 2009, the Pecos River Easement consists of approximately 710 acres with an eight-acre building envelope. Within the building envelope are River House, the swimming pool, a one-half acre Homestead Building Envelope (not to exceed 2,000 square feet) and other minor agricultural structures. The West Easement was executed in June 2010 and consists of approximately 1,116 acres of land with a ten-acre building envelope in which the Hacienda and Equestrian Facilities are located along with the Log Cabin building envelope which consists of two acres. Within this building envelope (one envelope designated around River House, and a second envelope around the Headquarters) the Landowner will be allowed to construct, enlarge, maintain, repair or replace existing and new residential and agricultural buildings and structures, provided however that the maximum allowable cumulative footprint for all buildings shall not exceed 125% of the current square footage of existing buildings. The remaining approximately 474 acres are not included the easement area. The erosion resistant anticlinal fold which created the Tecolote Range forced the Pecos River south to the path of least resistance into the soft shale and sandstones of the Glorieta Mesa exposing dramatic red and maroon sedimentary rock cliffs along its banks. The headwaters of the Pecos River originate in the Sangre de Cristo Mountains approximately one-hundred miles northwest of the Ranch fed by a multitude of glacial lakes and over ten tributary creeks. From its headwaters, the Pecos flows for approximately 926 miles southeast to join the Rio Grande River near Del Rio, Texas. Although the fishing season is year round, prime fishing is April through October with the exception of runoff from late March into May. Stoneflies including the large Salmon flies and Golden Stoneflies are prolific on the Pecos. There are also plenty of mayflies and caddis flies. Fly fishing the Pecos River during the stonefly hatches can be an angler’s dream. The big Salmon flies start hatching in late May and continue through mid-June. As the Salmon-fly hatch ends, the Golden stoneflies begin to hatch and continue into the middle of July. With mayflies and Pale Morning duns hatching into August and caddis flies into September, the fly fishing on the Pecos is fly fisherman’s paradise. …bead head nymphs or copper johns, size 12 or 14 – but nothing needs to be too small; or try any hopper pattern or stimulator on top – size 10 or 12 with a copper john or bead head nymph hanging down a couple of feet. Always barbless. Since purchasing the Ranch in 2000, Fonda has continuously enhanced the Pecos River. Substantial stream restoration has been integrated to improve trout habitat. Five Rivers Inc., based in Bozeman, Montana, methodically designed and implemented the river enhancement work throughout the oxbows and bends of the three and a half miles of the Pecos River that run through the Ranch. The construction of pools and riffles, boulder placement, stream-bank restoration and the astute placement of fish feeders have created an idyllic habitat for native and stocked rainbow and brown trout. In addition to Fonda, neighbors to the north and south of Forked Lightning Ranch have also actively managed the Pecos River fishery, restocking the River on an annual basis in an effort to bring the fishery back to its historical quality. 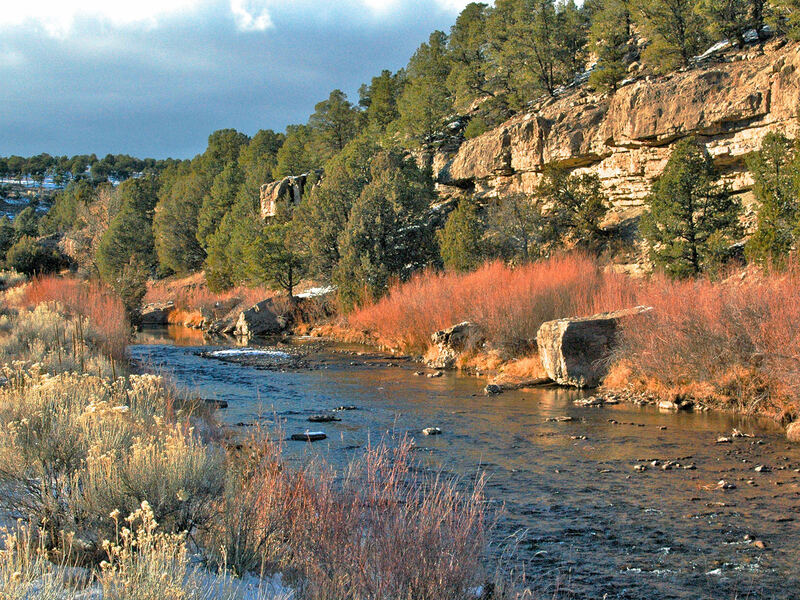 The 3.5 mile stretch of Pecos River that runs through the Ranch offers some of the finest trout fishing in the state of New Mexico. Additional details on the work that has been conducted on the River can be obtained by contacting our Bozeman, Montana Office. With the four distinct and beautiful seasons of north central New Mexico come an abundance of year-round recreation both on the Ranch and in the surrounding area. From the river valleys to the 13,000 foot mountain peaks, throughout the year there are ample opportunities for hiking, biking, horseback riding, fly fishing, water sports and snow sports. Adjoining the Ranch boundary to the north and east are 311,040 acres of the Pecos National Forest – part of the 1,558,452 acre Santa Fe National Forest. The varied topography includes deep canyons, broad mesa tops, heavily forested slopes and rugged ridges. At the southern extent of the Rocky Mountains, hikers take advantage of the extensive trail network through the Sangre de Cristo Mountains of the Pecos Wilderness including 13,103 foot South Truchas Peak. Situated about 30 miles due north of the Ranch, this is the second highest point in New Mexico. Within the Wilderness area, anglers have access to fifteen lakes and over 150 miles of streams, where rainbow trout, brown trout and Rio Grande cutthroat trout – the New Mexico state fish, can all be found. These waters head the Pecos River which flows through the Ranch. About 40 minutes from Forked Lightning Ranch, Ski Santa Fe is nestled high in the beautiful Sangre de Cristo Mountains. With a base area elevation of 10,350 feet and the summit at 12,075 feet, Ski Santa Fe is among the highest ski areas in the continental United States. The seven chair lifts access 77 trails covering 660 acres of skiable terrain. Both novice and veteran skiers and snowboarders can find their place on the mountain with steep bump runs, powder-filled chutes, gladed tree-skiing, and plenty of groomers. If golf is your quest, over half a dozen courses are within 30 minutes of the Ranch. Public, semi-private and private courses range from 9 holes to 36 holes. The Club at Las Campanas, a private club located in the desert hills northwest of Santa Fe, offers two “Jack Nicklaus Signature” golf courses, as well as a fitness center, tennis courts and a popular equestrian facility. In 1925 the iconic rodeo promoter and “King of the Rodeo,” John “Tex” Austin purchased a series of parcels from the Pecos Pueblo Grant and called his new acquisition “Forked Lightning Ranch.” He hired famed architect John Gaw Meem to construct his ranch compound. As the popularity of rodeo grew, Austin capitalized on the urban attraction to rodeo and the eastern curiosity about the newly discovered West and began a dude ranch on his Forked Lightning Ranch. The “dudes” traveled at their own expense, two days by train from Chicago for the chance to trail cattle in the Wild West in Comanche Indian country. He would invite dudes to participate in cattle drives between Forked Lightning Ranch and his ranch near Las Vegas, New Mexico. Austin was widely known for bringing rodeo into mainstream America. His promotion of rodeo across the United States and parts of Europe brought international acclaim. In the 1930s, The Great Depression hit and the King of Rodeo lost his Ranch to the bank. The storied history of Forked Lightning continued when Texas oil tycoon E.E. “Buddy” Fogelson purchased Forked Lightning and expanded it to over 13,000 acres! But it was Fogelson’s marriage to Hollywood heartthrob, Greer Garson in 1949 which truly put the spotlight on the Santa Fe area and Forked Lightning Ranch in particular. Her Academy Award for Best Actress in 1942 for Mrs. Miniver brought her international notoriety. During the World War II era with one of Hollywood’s most popular film stars calling Forked Lightning Ranch home – Santa Fe was put on the map of the Hollywood elite. Garson was one of the first film stars to reside in the Santa Fe area – the beginning of things to come. Greer Garson’s personally engraved saddle which was purchased by Fonda in an auction, hangs over the railing in the galleria and is available for purchase as Personal Property. Upon the death of Buddy Fogelson in 1987, his empire was divided into several parcels. Greer Garson Fogelson, who inherited part of the Ranch, sold her portion in 1991 to the Conservation Fund who in turn donated the land to the National Park Service as a part of the Pecos National Historical Park. On a wintery day in 2000, Forked Lightning Ranch drew the attention of yet another iconic Hollywood actress seeking the peace and solitude of the Pecos River and the Tecolote Range. Architectural Digest, March 2014, Page 144 . Upon beholding the trout-rich waters of the Pecos River with the privacy and serenity offered by the surrounding landscape, Fonda had found her personal sanctuary. Her deep appreciation and respect for the historical significance of the area is evident in her tasteful creation of the Spanish colonial-style River House and her authentic restoration to the existing improvements. Steeped in the rich history of the Southwest, the mesas and valleys of North Central New Mexico are home to some of the oldest civilizations known to America. With early native settlements dating back nearly 11,000 years, the historical and cultural significance of the Pecos River Valley is still evident today. The early natives understood that the Pecos had great potential to provide their people with food, shelter and water. As early as 800 AD, pre-pueblo people lived in pit houses along drainages of the area. Around 1100, the first Puebloans began building their rock-and-mud villages in the valley. Over the next two centuries over two dozen villages were developed. However, due to unknown circumstances most of the small villages were abandoned, and all efforts were put into developing Pecos Pueblo. By 1450 this five-story high well-planned fortress had a population of over 2,000 Puebloans. Similar to inhabitants of the area today, the Pecos people enjoyed a rich culture with inventive architecture and beautiful crafts. The ruins of their 15th century fortress can be viewed today at the Pecos National Historical Park. Historians will refer to Pecos as a “gateway” – a natural portal through the southern reaches of the Rocky Mountain’s Sangre De Cristo Range between Santa Fe and the Great Plains. In 1821, William Becknell utilized this natural portal in pioneering the Santa Fe Trail, a transportation route that connected Franklin, Missouri with Santa Fe, New Mexico. It served as a vital commercial and military highway until the introduction of the railroad to Santa Fe in 1880. Still visible today, the ruts of the Trail travel along the eastern property boundary of Forked Lightning Ranch. 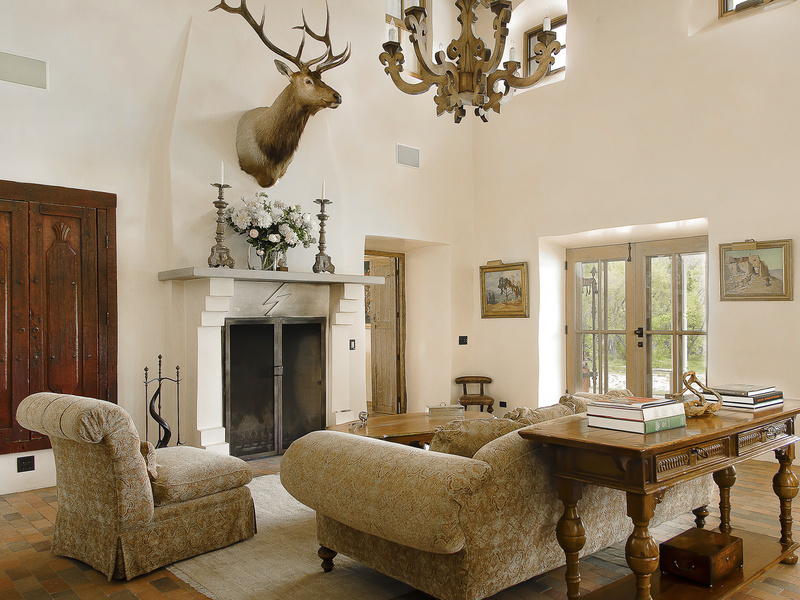 Forked Lightning Ranch enjoys a premier location in close proximity to one of the Rocky Mountains most desirable and notable settings – the historic city of Santa Fe. The Ranch reflects Jane Fonda’s commitment to land and water stewardship through sustainable-building practices, water conservation and environmental preservation. Fonda’s passion and respect for native culture and the historical significance of the area is evident in every detail as manifested throughout the Ranch. During her ownership, she has carefully enhanced the ecosystem of the Ranch by selectively clearing invasive cedar groves, resting the native pastures and carefully enhancing the River corridor and trout fishery. By maintaining the simplicity of ownership without the encumbrances of a complex agricultural operation, a new owner could enjoy the healing tranquility and enjoyment of what the Ranch provides. The privacy and sense of place is evident upon savoring the unsullied views and stillness from the patio of River House. 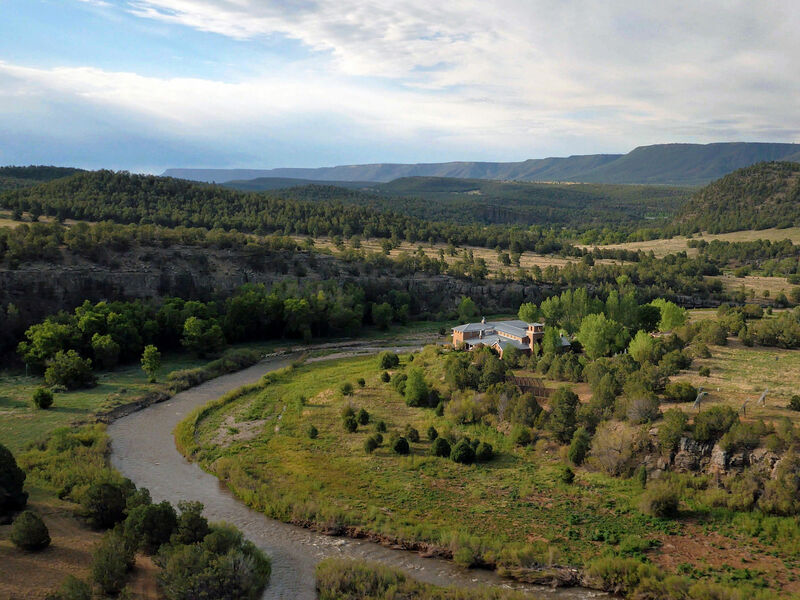 The serene waters of the Pecos River are actively sought by those desiring privacy without isolation in a North Central New Mexico mountain ranch property. Attractive live-water properties with enough size to provide a sense of privacy and security within close proximity to an attractive urban center are rare in New Mexico. 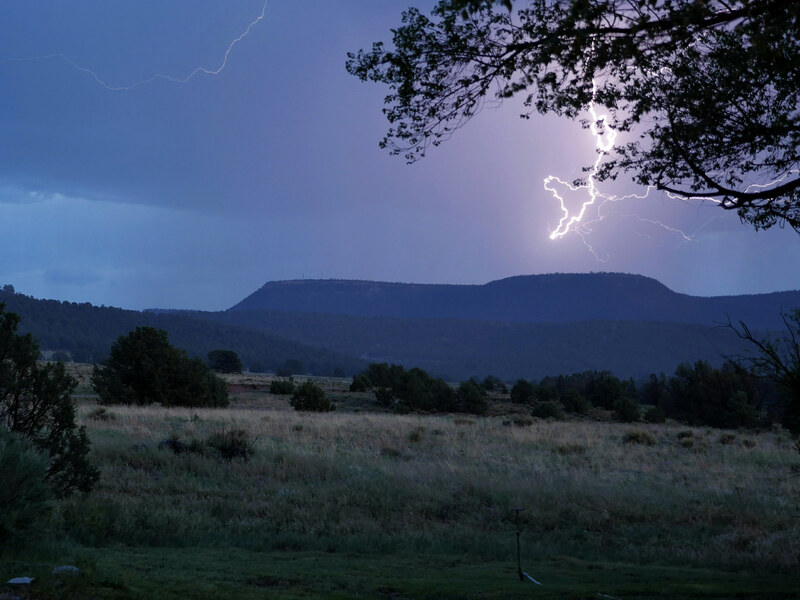 Forked Lightning Ranch offers an uncomplicated means of owning one of New Mexico’s most fabled and legendary ranches. The iconic chain of ownership tied to the Ranch places the next owner in line with some of the more notable personalities of New Mexico’s recent history. 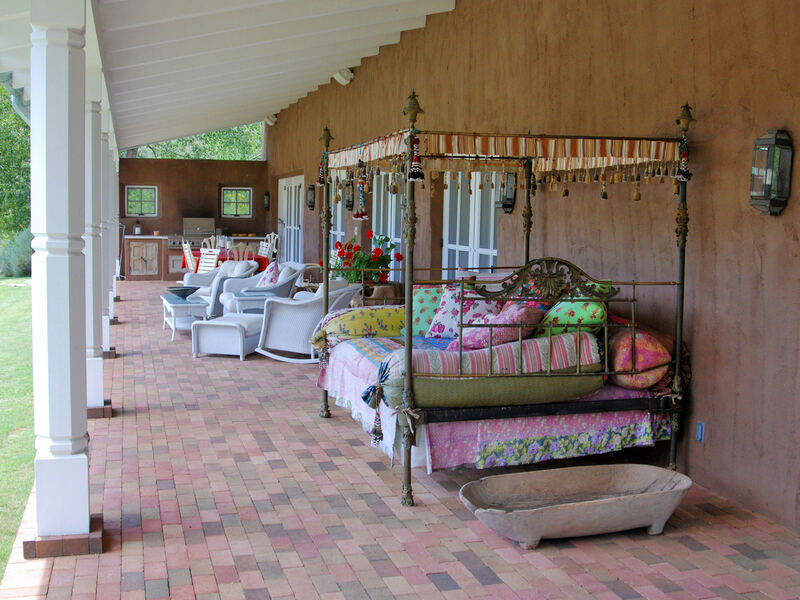 Fonda’s extensive personal collection of antiques, artwork, rugs, furniture and literary collection which complement the architectural design of River House are available for purchase as well as the Ranch equipment and machinery. These chattels would be negotiated and purchased outside of the real estate transaction. A complete inventory of Personal Property and ranch equipment is available by contacting our Bozeman Office and subject to the terms contained in the Offering Price and Conditions of Sale.